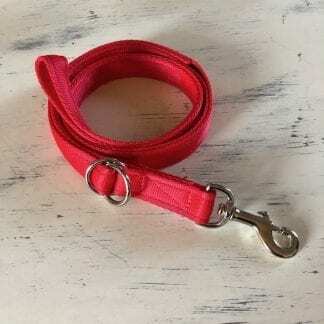 A very popular dog lead, soft to the touch and durable. Comes in various lengths with an O ring on the handle, ideal for putting over your shoulder while your dog is off the lead. 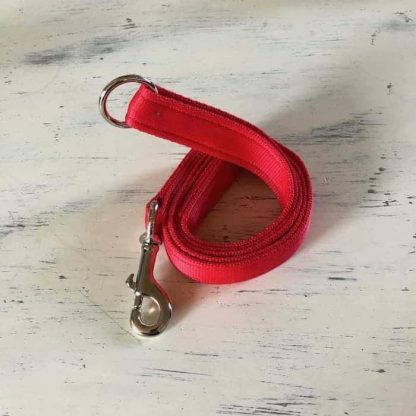 Coming in widths and lengths to suit all dog sizes, our leads are so customisable, you’ll be spoilt for choice. Want a pink lead? No problem. Want a blue or yellow dog lead? No problem. A padded handle maybe or a slightly more bespoke option of a brass trigger hook? We can make pretty much anything your heart and imagination desires. Safety is paramount in all of our designs and with our customer service that others can only aspire to, you can be sure of being completely satisfied with the Meg Heath experience. If you’re not, then we will make sure we do everything in our power to rectify that. The ever-popular cushion web dog lead, the difference with ours is that you will probably only ever need one or two in your dogs’ lifetime unless of course it gets chewed or if you lose one. The leads have a lifetime stitching guarantee, which means we will replace it if there is a fault with the stitching. They come in a variety of colours, 2 widths and different lengths. The leads can also be modified to have brass fittings to ensure an even longer life. This lead compliments all of our dog collars, but our top-tips are the beautiful half check collar or the flat collar. “Sarah, your dog leads last forever, how do you ever earn a living? Top product, highly recommended.” Mrs S. from Weymouth. “We purchased a dog lead 6 years ago from Meg Heath and we are just replacing it now, but we are opting for the brass fittings through a good recommendation”. Mr P. from Birmingham. I recently bought a collar 25mm, lead 25mm and Martingale harness all in bottle green. The quality of these items is immeasurably better than any thing else I’ve seen or used and the service second to none. Sarah took time to advise me to ensure I chose the right size of harness and delivery was remarkably quick and in the Christmas rush. Many thanks to you Sarah. I have had your leads before and they are the best I have ever had. I like the way I can order any length and in any colour. Highly recommended. They don’t always last that long because my dog sometimes chews them when I am not looking. Naughty boy ! I’ve bought two of these leads in two different lengths and colours. One has brass fittings and the other nickel. The ring on the handle is a nice touch and allows you to shoulder the lead when not in use. They are both made to an impeccable standard & the 25mm width is very comfortable to hold (either wet or dry) I’ve bought a bright coloured lead so it was obvious from a distance that my dog was on a lead, more reassurance for others including concerned sheep farmers. Wouldn’t hesitate to buy another. Thanks. The leads are of the very best quality. I have previously ordered 2 training leads – they have been trailed through mud, along the beach, round the park, hosed down and they are still in excellent condition! The two 1.8 m leads I have just received have a very useful D ring on the handle – so good for clipping round your neck when off lead and even for clipping 2 leads together sometimes. Dear Sarah, Just wanted to say how happy we are with the lead we purchased from you. It arrived quickly after ordering it. The lead is light, well made and comfortable to use. More importantly our dog is happy to have in on when on a walk. I would recommend this lead. The dog lead I picked is the perfect partner to the harness. I went for a slightly longer length than we usually use which gives Elsie a little more freedom when it comes to walking on lead. It’s worth noting that you can get this lead as long as 4 metres in length should you require this! The lead is super soft to the touch and again, feels very durable even though it is super lightweight. It’s extremely comfortable to hold, the handle loop is nice and big and I love the addition of the O ring attached to the handle. This makes it ideal for putting over your shoulder whilst your dog is off lead. I am so pleased with these products. They have instantly become the combo we reach for every day when it comes to walkies (harness and dog lead). Simplistic in design yet incredibly well made and so comfortable for both pup and owner too! I’d highly recommend Meg Heath if you are looking for a well made, comfortable and bespoke product for your dog! I just wanted to say a big thank you for dealing with my last minute order before you went into hospital. It arrived the very next day! I’m so pleased with it. It’s so nice to have a lovely lightweight lead in exactly the right length, width & colour & a small clip. It’s absolutely perfect for my little Yorkie as standard leads can be quite heavy around her neck. I hope all went well with your knee op & that you are now recovering. Purchased both a training lead and short lead for new rescue dog. Great service and excellent quality. Many thanks. This is a review of my experience with megheathdogleads. I made an initial enquiry trying to get a 3 metre dog lead (I hunted all over to get one) for my little dog, a cross between a Jack Russell and miniature chihuahua. This company went above and beyond. Sarah asked my requirements and within 3 days had made and delivered to me the exact lead I needed. She sourced the material and fittings immediately. I cannot praise the dedication to customer service and the quality of the finished product enough. This is a company that has the highest standards, and I have no hesitation in recommending them. Thank you once again Sarah. Dear Sarah, We’ve had our webbing lead for nearly two years and it’s had to put up with a lot of abuse from our Bedlington Whippet cross (she pulls like a train!) The lead is still in brilliant condition. I’m especially impressed with the softness, and of course the price. The length and O ring make it perfect for clipping over my shoulder whilst she is off lead. If it ever wears out, I shall definitely be buying from you again. Many thanks Emily. Very good service. Thank you, Wendy. Sarah your leads last forever, how do you ever earn a living doing this. Top product, highly recommended.